Overall, Cisco forecast that annual global Internet traffic will reach 2.3 zettabytes in 2020 (a zettabyte is 1 trillion gigabytes), which 10x greater than 2010’s traffic of 232 exabytes. 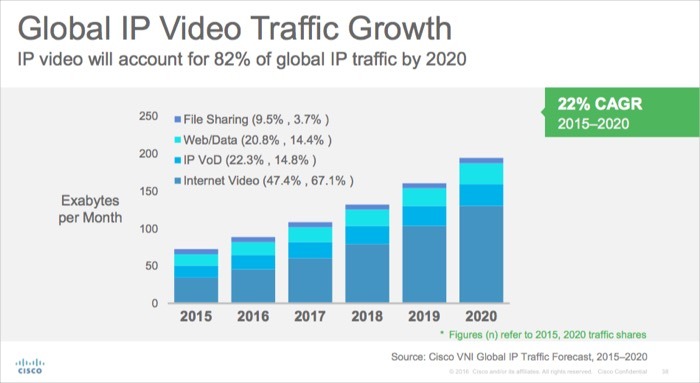 In addition to more video viewing, Cisco pointed to 3 other factors fueling the growth into 2020: more Internet users (4.1 billion, up from 3 billion in ’15), more devices and connections (26.3 billion, up from 16.3 billion in ’15) and faster broadband speeds (average of 47.7 mbps, up from 24.7 mbps in ’15). Smartphones will become the most important device, fueling 30% of traffic, just ahead of PCs, which will drop to 29% (from 50% in ’15). Cisco said that just 10% of time with smartphones will be for talking, with the other 90% for video and data. Reflecting this shift, mobile video will grow at a rate of 17.2% per year through 2020, 4x the rate of online video and digital TV. Connected TV devices will also surge, growing to nearly 243 million globally by 2020. Cisco also said that in 2015 cord-cutting household consumed 102 GB of data per month, compared to 49 GB for average households. Higher resolution video is also an important contributor to video traffic. Cisco estimates that 16% of global Internet traffic by 2020 will be ultra-HD video, up from 2% in ’15. The Cisco VNI is the latest evidence of how dominant online and mobile video are becoming, and how much they are driving network operators’ capex in broadband expansion. It’s quaint to think about the not-so-distant past when video played only on desktops in postage stamp sized window with video and audio out of synch. Now it’s routine to enjoy HD video on the big screen. All of this is enabled by the massive network investments that broadband ISPs have made. The Cisco VNI can be downloaded here.